So the favorite festival of the whole World, Christmas is finally here and I think the whole World is decked up with lights. 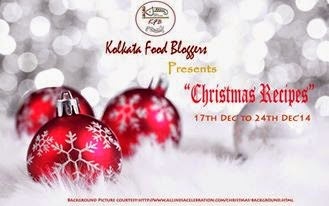 Here in India, the celebration of Christmas is limited to some colorful lights and eating cakes on Christmas Morning. But nowadays, people in India are also putting up a Christmas tree at their home and decorating it with ornaments like it should be. A man dressed up as a Santa Claus can be seen at almost all the supermarkets and shops here nowadays, this way children are getting aware of all festivals around the World. I don't decorate and put up a Christmas tree every christmas but I always bake lots of fruit cakes every year for my family and relatives. 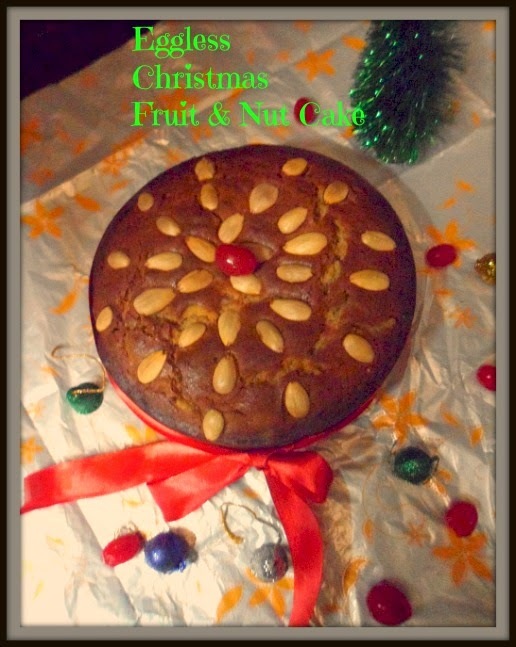 I made this Dry Fruit & Nut cake last Christmas, but this year I tried an eggless version of Fruit cake, which came out really well. I'll share the recipe today, so you all can try out that too for your vegetarian friends. Tastewise it doesn't make a bit of difference, that I can assure you and the texture was outstanding. I got many positive feedback from relatives. This recipe uses Yoghurt/curd as the binder and don't need any eggs or butter as other recipes do. As there is no egg, there is no need of beating. 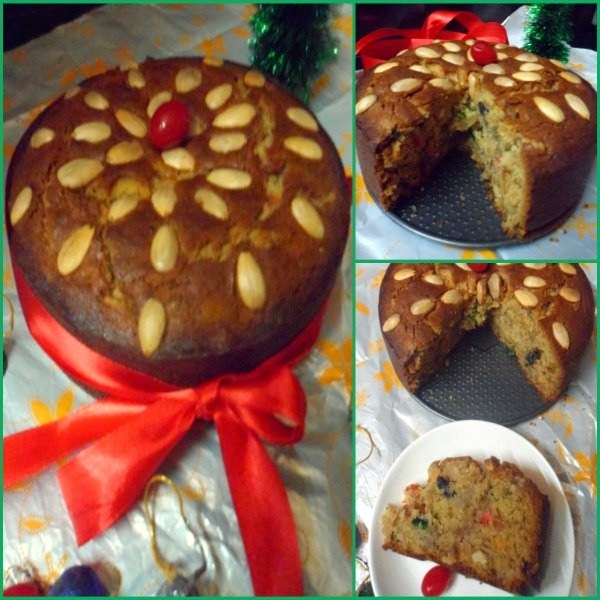 A totally hassle-free but healthy and flavorful fruit cake loaded with lots of goodness. Usually for making fruit cakes, you need to soak the dry fruits and nuts in rum and wine for a month or more, but this time I couldn't do it and soaked them in orange juice and rum for 7 days only and got an excellent result, but the more it soaks, the better the outcome is. Vanilla essence : 1 tsp. Hot water : 2 tblsp. Lemon zest/essence : 1/2 tsp. Cinnamon powder : 1/2 tsp. Clove powder : 1/4 tsp. Dark rum : 3-4 tblsp. Preparing the dry fruits : traditionally, dry fruits and nuts are soaked in rum fully. But I didn't, instead Isoaked them in orange juice and little amounts of rum. But you can completely avoid rum. Preheat oven to 200 degreeC. Grease the bottom and sides of a pan with butter/oil. Set aside. Sieve the flour with shah jeera powder, cinnamon powder, ginger powder, clove powder and nutmeg powder and keep aside. In a bowl, add room temperature yogurt and powdered sugar(brown and white) and beat till the sugar is well incorporated. Add baking powder, 1/2 tsp baking soda and vinegar. Mix. Leave aside for 5 minutes and you will find that bubbles appear on the top. Add the vegetable oil, vanilla essence, honey, lemon zest and mix well. Now, slowly fold in the flour little at a time, without over mixing. Sprinkle 2 tblsp. flour over the rum soaked dry fruits and fold them into the batter lightly. Just before pouring the batter into the loaf tin, dissolve 1/4 tsp baking soda in 2 tblsp. hot water and pour this mixture over the cake batter and fold it in with a light hand. Do not overmix or over beat. Immediately pour the batter into the prepared baking pan and bake at 200 C for 30 minutes, them lower the temperature to 170-180 degree C and continue baking till done or till a toothpick inserted in the middle of the cake, comes out clean. Remove from oven and cool on wire rack for 30 minutes and remove from baking pan. Bring the cake to room temperature and slice. Instead of Vinegar, you can use lemon juice. Instead of soaking the fruits in alchohol, you can soak them in grape juice or orange juice. 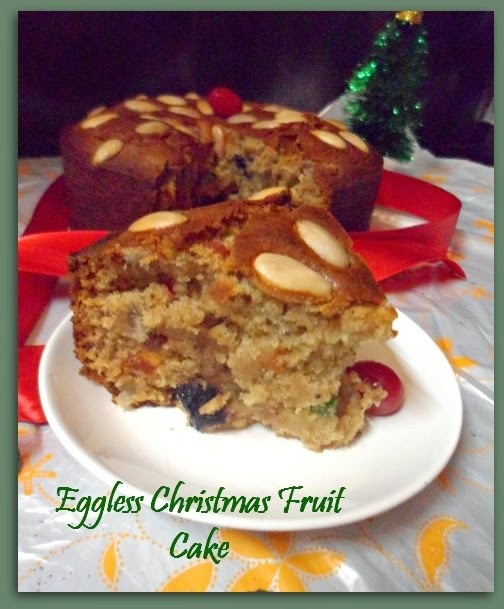 Sending this recipe to Kolkata Food Blogger's ongoing event, "Christmas Recipes"
Cake seem to have turned out great!